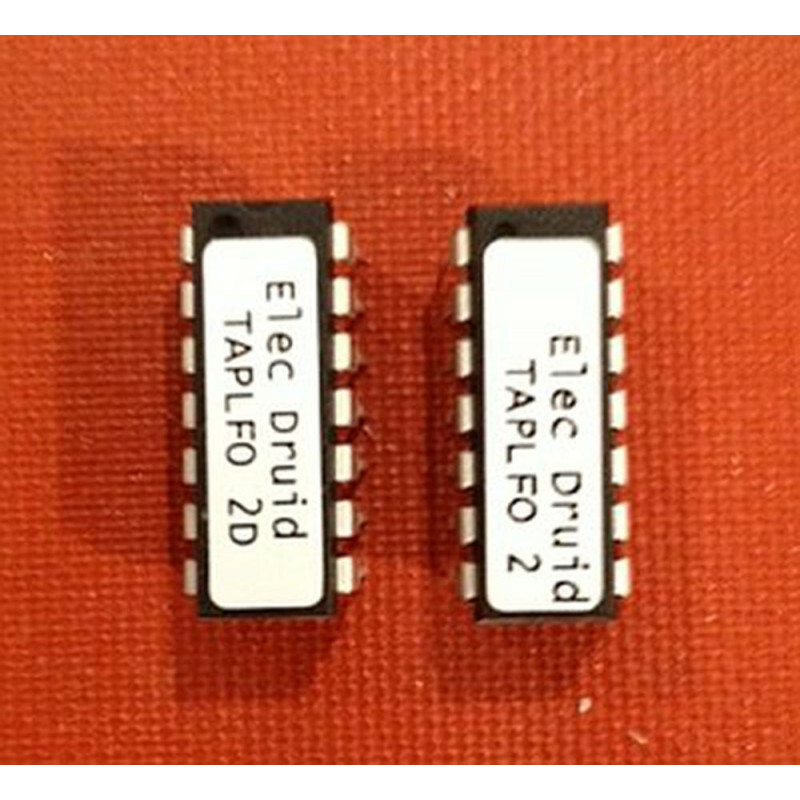 "This simple Tap Tempo LFO is based on the PIC 16F684. You can set the LFO frequency by tapping a tempo on a button connected to the chip, or by changing the Tempo CV. With this chip you can build tap tempo effects units or stompboxes, tap tempo controlled drum machines or tap tempo sequencer clocks. 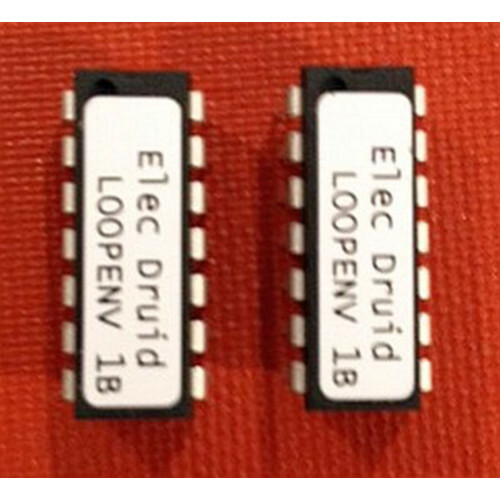 All of these are described in the datasheet below. The LFO can produce 8 waveforms, including a random (sample & hold) wave. All the waveforms except the random wave can be altered by the wave distortion CV. See the VCLFO page for more details of waveform distortion. The chip also includes a tempo multiplier. This is combined with the tapped tempo to allow the LFO frequency to be set at a multiple of the tapped rate. The available multipliers are 0.5, 1, 1.5, 2, 3, and 4. This allows half- and double-time, and triplet times. 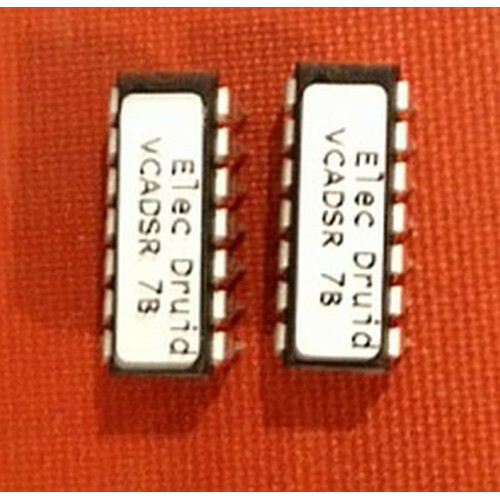 The LFO tempo, multiplier, waveform selection, wave distortion, and output level are all voltage-controlled using 0-5V. 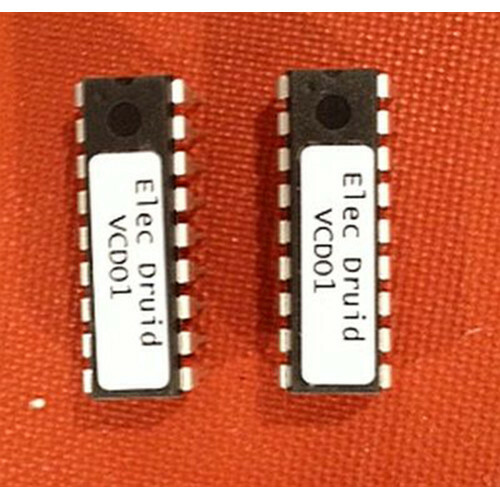 Unwanted features are easily disabled by tying the relevant pin to a constant voltage (usually 0V or +5V). 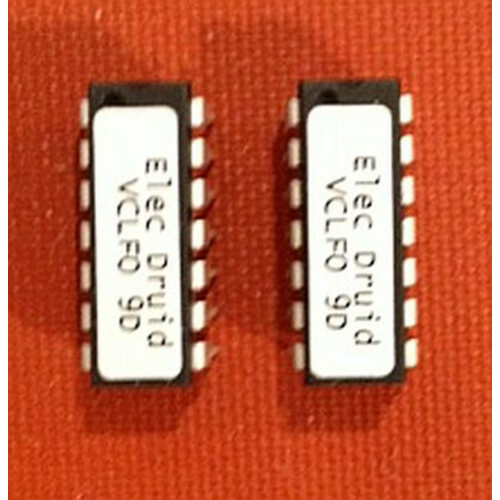 this is a bag containing (2) two of the electric druid LOOPENV 1B digital IC With compliments..
this is a bag containing (2) two of the electric druid noise generator digital IC With compli..
this is a bag containing (2) two of the electric druid VCADSR digital IC With compliments to ..
this is a bag containing (2) two of the electric druid VCDO1B digital IC With compliments to ..
this is a bag containing (2) two of the electric druid VCLFO digital IC With compliments to T..